Two of the primary science-focused agencies in the federal government have revamped their sexual harassment policies in response to findings of widespread problems in the community and are working together for further changes to rid themselves of the “pervasive culture of sexual harassment” in the field. The National Science Foundation’s new policy will require all grantees to accept as a term of their award to report any findings of sexual harassment to the agency. NSF said it would not tolerate any sexual misconduct either within the agency or at any awardee organizations, field sites or “anywhere NSF-funded science and education is conducted.” The agency will post the final rule on Friday and it will go into effect on Oct. 21. It follows a proposed rule issued in February that received more than 200 comments. Any organization receiving an award or award adjustment after that date will have to notify NSF following any finding of sexual harassment within 10 days. The agency will then consider the safety of those working on the award, the impact to the activity, the advancement of taxpayer dollars and science, and whether the awardee has taken sufficient action to ensure the project can continue its progress. NSF may then decide to remove the technical director on the award, reduce the award amount, suspend the project or terminate it entirely. 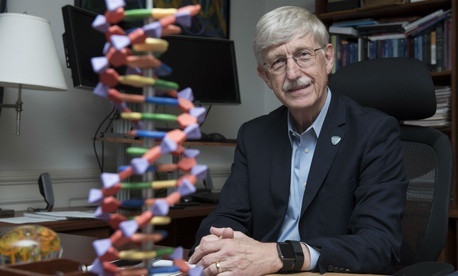 Francis Collins, director of the National Institutes of Health, said different legal constraints that apply to his agency prevented it from making the same changes as NSF. Still, the agency on Thursday posted to the Federal Register an update to its sexual harassment policy. It promised to take “timely and appropriate action” against any employee found to be in violation of the policy, saying the update would “increase transparency and consistency” into how it handles allegations of harassment. It also clarified that “romantic and/or sexual” relationships between coworkers, especially those in which one employee holds power over another, may not be appropriate and are “strongly discouraged.” Any such relationship must be disclosed to the agency. While it was not yet including it as a condition of receiving NIH funds, Collins said he was hopeful the new policy would make clear to grantees that they should “have in place rigorous policies and related procedures for their employees, contractors, trainees, and fellows who engage in agency-funded activities.” NIH will also form an advisory committee of both its own employees and outside leaders in the science community to guide the agency’s future decision-making on the issue. Earlier this year, the House Science, Space and Technology Committee held a hearing titled “A Review of Sexual Harassment and Misconduct in Science,” at which an NSF official testified along with several women in the scientific community. Lawmakers noted longstanding problems with sexual misconduct in the field and implored agencies not to provide any federal funding to researchers who engage in inappropriate behavior. Several agencies have taken on sexual harassment in recent years following high-profile scandals. The Interior Department and Federal Emergency Management Agency both announced new policies during the Trump administration following what they identified as systemic cultural problems.